Welcome to Marvel Strike Force Heroes page. This is the full description of MSF Ms. Marvel stats, skills and abilities. Ms.Marvel is an Inhuman Brawler who has the capabilities of a protector and acts as a protector. Her first skill inflicts heavy damage and applies Deflect to Ms.Marvel. Her second ability heals her for a high amount of health (50%Max HP + 5000 HP) but if she is under 50% of health also debuff her with Slow. Ms. Marvel ultimate deals medium damage to all enemies and provides her with a 40% chance per target hit to generate 1 Ability Energy to random HERO ally. Her passive ability grants her automatic Taunt every time HERO ally HP drops below 50% and if that HERO ally is Brawler she additionally gains 2 Deflect. Above all that she has a 20% chance (100% on ability level 5) to gain Assist Now from each HERO Brawler in a team and same chance to grant Assist Now on HERO Brawler turn. Ms. Marvel is a very interesting hero who has higher base damage than Iron Man and more Health than Captain America. Problem is that she is practically useless if her allies don’t have HERO trait and if there are no HERO Brawlers in a team. Her price is only 15 shards which can be obtained through Premium Orbs, Mega Orbs, Jersey's Hero Orbs, M'Kraan Orbs, Hometown Heroes Orbs, and 2-6 Mystic Campaign mission. Ms. Marvel is a plucky Super Hero brawler who assists and generates ability energy for her allies. Attack all enemies for 90% damage + 20% chance to generate 1 Ability Energy per target hit. Energy is granted to random HERO allies. 20% chance to Assist Now on each HERO BRAWLER ally’s turn. On Turn, 20% chance to grant Assist Now to a random HERO BRAWLER ally. What are Ms. Marvel’s stats? 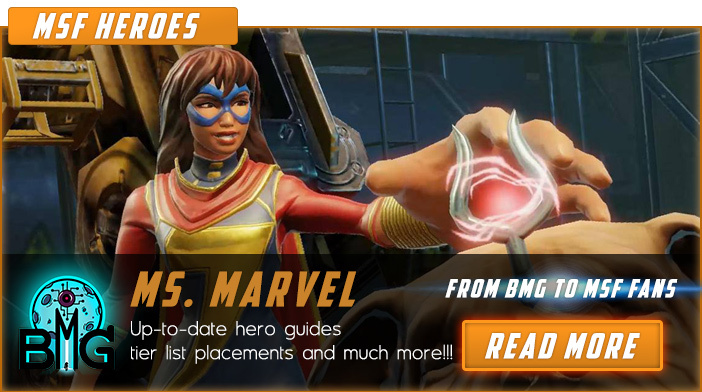 We hope that you enjoyed the description of MSF Hero Ms.Marvel. For detailed information about other MSF Characters check our MSF Heroes page.